The Pro-Am Surfing Program revolves around the story of Richard K. Salick. 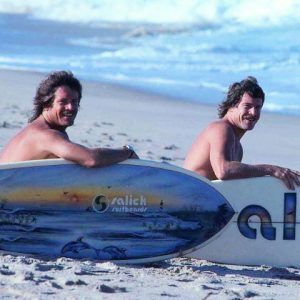 Richard along with his brother Phil, both surfing professionals, founded the Cocoa Beach Surfing Festival over 40 years ago as a way to help raise funds to fight kidney disease and help dialysis patients. Richard has a close connection to kidney disease. He was a 23-year-old, world-class professional surfer (a member of the U.S. and World Surfing Teams) living his life on the beaches of Florida and traveling around the world when his kidneys failed. He was diagnosed as having IGA Nephropathy/Glomerulonephritis, a disease that breaks down the tiny filtering units in the kidneys. Richard was then put on a kidney dialysis machine for eight hours a day, three days a week. He knew from the beginning that he wanted to have a transplant. Fortunately, he had a very willing donor—his identical twin brother, Phil. In September 1974 the transplant was performed at Shands Teaching Hospital at the University of Florida. While the transplant was successful, Richard had a series of reactions to medications and was hospitalized about 15 times during the year that followed. At the time he was told to never surf again. It was far too dangerous. Richard thought his surfing days were over, but his love for the sport made him yearn for a way to comeback. One day while walking alone on his beloved Cocoa Beach, during a sizeable ground swell, he thought of ways to enter the surf again. Surfing was the way that he had always relaxed and it kept him in top physical condition. This surf lifestyle had been with him since childhood; his first ride was on a homemade wooden surfboard in the spring of 1963 on Anna Maria Island. Since the transplanted kidney lies in the abdomen, only one-half inch beneath the skin, some type of protective gear was necessary. Through trial and error, Richard, with materials help from Cypress Gardens, (and the advice from the inventor of Gatorade, Bob Cade MD) designed a protective ensolite pad that fit into his swim trunks offering the needed protection. Less than one year after the surgery he began hitting the waves again. 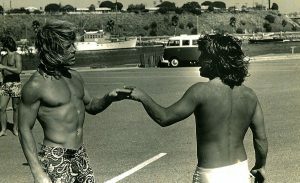 In April 1975 he entered his first surfing competition since the transplant and finished a strong second place. A month later he entered his second competition and won the event! This trophy still sits in the dialysis center at Shands Teaching Hospital in Gainesville. Rich ard traveled the country talking about the successes of transplantation. There had not been anyone that had done this kind of vigorous physical activity after a kidney transplant ever! Big waves or small waves, Richard was back in his beloved surf! He continued professional surfing for the next three to four years, always finishing in the top ten and winning many of the contests before he went into semi-retirement. In 1977 Richard was awarded the prestigious “Nancy Katin Award” at the United States Surfing Championships at Huntington Beach, California. Awarded to one surfer in the world annually & judged by the Presidents of the Worldwide Surfing Associations. It was 1976, only two years out from his first kidney transplant that he began focusing attention on the plights of other kidney patients. 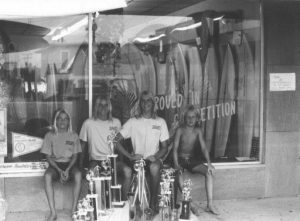 That year, he and his brother Phil and the Salick Surfboards Surfing Team put together a surfing competition at Cocoa Beach. The twins would, literally, hand carry a bundle of cash to various dialysis units for needy patients. The first event raised $125. The yearly competition continued, but $1600 was the largest amount of money raised. After the Birth of his two sons Philip (76) and David (84) Rich was certain that his health was solid. Nothing is better than being out in the surf with your children! Then in 1985 at the urging of Craig Tisher, MD, then Chief of Nephrology and Hypertension at the University of Florida,(now Dean of Medicine) and Region 2 Vice-President of the National Kidney Foundation (NKF), the event took on National sponsorship and became the NKF Florida Team Invitational Pro-Am Surfing Tournament. That first event grossed more than $60,000 and funds were directed to seed the National Kidney Foundations’ Research Endowment Fund. This festival is the largest charitable surfing festival in the world and has been attended by thousands including world class surfers for the past 27 years. Started by 2 professional surfers themselves, Rich and Phil Salick this event has grown tremendously and made it possible for the NKF of Florida to support programs in patient services, public and professional education, and organ donation. Rich was employed by the NKF for over 30 years as the Director of Community Relations for the National Kidney Foundation of Florida. Rich was honored by selection and induction to the Surfing Hall of Fame in January of 2000 as an “East Coast Legend”. Brother Phil followed Rich into the Surfing Hall of Fame in January of 2004. This story of three brothers and their sacrifice to keep their brother alive is an inspiring and supportive endorsement of Transplantation. On July 2nd, 2012, hundreds of people around the world were shocked with the news that our beloved Richard K. Salick had passed away during emergency surgery. The 27th annual event was renamed in Rich’s honor to the NKF Rich Salick Pro-Am Surfing Festival. The legacy and memory will live on in each and every person that Richard touched and inspired during his lifetime. “I say Thank You to God, every time that I spend time with my sons, Philip and David.” “Transplantation is to me, certainly, has been a living miracle”. May God Bless you all! !